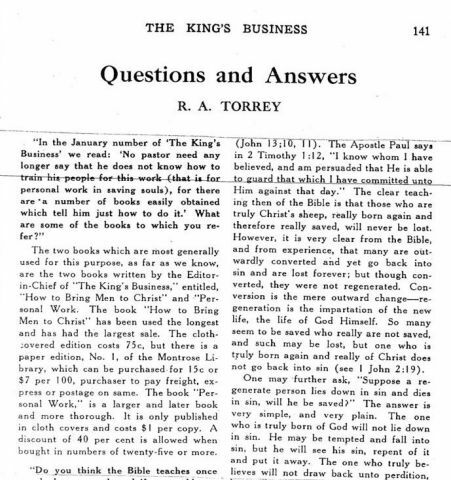 The two books which are most generally used for this purpose, as far as we know, are the two books written by the Editor-in-Chief of “The King’s Business,” entitled, “How to Bring Men to Christ,” and “Personal Work.” The book “How to Bring Men to Christ” has been used the longest and has had the largest sale. The cloth-covered edition, No. 1, of the Montrose Library, which can be purchased for 15c or $7 per 100, purchaser to pay freight, express or postage on same. The book “Personal Work,” is a larger and later book and more thorough. It is only published in cloth covers and costs $1 per copy. A discount of 40 per cent is allowed when bought in numbers of twenty-five or more. In John 10:28, 29, the Lord Jesus distinctly teaches us that He gives unto His sheep eternal life and that none of His sheep shall ever perish and that no man is able to pluck them out of the Father’s hand. In John 17.12 (see R.V. ), the Lord Jesus is recorded as having said to the Father, “While I was with them, I kept them in Thy name which thou hast given me; and I guarded them and not one of them perished.” He goes on to say that the son of perdition perished but He distinctly says in anther place that the son of perdition was never regenerate (John 13:10,11). The Apostle Paul says in 2 Timothy 1:12, “I know whom I have believed, and am persuaded that He is able to guard that which I have committed unto Him against that day.” The clear teaching then of the Bible is that those who are truly Christ’s sheep, really born again and therefore really saved, will never be lost. However, it is very clear from the Bible, and from experience, that many are outwardly converted and yet go back into sin and are lost forever; but though converted, they were not regenerated. Conversion is the mere outward change– regeneration is the impartation of the new life, the life of God Himself. So may seem to be saved who really are not saved, and such may be lost, but one who is truly born again and really of Christ does not go back into sin (see I John 2:19). One may further ask, “Suppose a regenerate person lies down in sin and dies in sin, will he be saved?” The answer is very simple, and very plain. The one who is truly born of God will not lie down in sin. He may be tempted and fall into sin, but he will see his sin, repent of it and put it away. The one who truly believes will not draw back unto perdition, but will continue steadfast to the saving of the soul (Heb. 10:38, 39). The Bible beyond a doubt clearly teaches the security of the true believer. If we know that we truly believe in Jesus Christ then it is our privilege to know that we have eternal life (I John 3:13), and that therefore we shall never perish (John 10:28, 29). Our confidence, however, will not be in our own perseverance; that is, in “the perseverance of the saints,” but our confidence will be in the perseverance of the Saviour. He never breaks His covenant and He has covenanted to give us eternal life and to secure us from ever perishing. The explanation of 2 Peter 2:20,21,22, is plain enough if one will read the whole passage. One who is outwardly converted may escape for a time the pollutions of the world through the knowledge of the Lord and Saviour Jesus Christ, but the Divine nature has not been imparted to him; he is not a sheep but simply a washed sow, i.e. there has been merely outward cleansing. A washed sow is not a sheep. A washed sow will soon find the mud puddle again and lie down in it. A sheep may fall into the mud but will get up and out of it just as quickly as it can. As to Hebrews 6:4,5,6, the explanation of this passage also is simple –there is a work of the Holy Spirit that is short of the work described in this passage –the one with whom the Spirit of God does work to this extent may drift away and at a later day again a more thorough work of the Holy Spirit be done in his heart. This passage, however, is written to Jews who were not merely ind anger of falling temporarily into sin but in danger of falling away, i.e. apostatizing and going back into Judaism and renouncing Christianity. If a Jew should go as far as is described in this passage and afterwards not merely fall into sin but apostatize and go back into Judaism and renounce Christ, it would be impossible to renew such an one again unto repentance. But the Apostle plainly declares three verses further down in the chapter that the writer did not expect that they would thus fall away (verse 9). He just mentions the result to keep them from falling away and the warning would keep them from actually falling away. The explanation of Romans 8:6 is found in the Revised Version, viz. : “For the mind of the flesh is death but the mind of the Spirit is life and peace.” The believer may be carnal in the sense of 1 Corinthians 3:1, that is, the flesh may be permitted to work to a certain extent, and yet not be on the whole governed by the mind of the flesh. Hebrews 10:26 is also easily explained. It means exactly what it says. The word translated “willfully” means “of deliberate choice.” A regenerate man may sin through ignorance or through weakness but he will not make a conscious, deliberate choice of sin. If one does this, with a full consciousness of what he is doing, make a deliberate, hearty choice of sin, it proves that he was never born again, and furthermore, there remains for him no more sacrifice for sin. The word translated “everlasting” does not mean “ages.” It means lasting through the ages, i.e., not lasting through an age, but through ages. It is used generally of things that have no end, but there are some exceptions to this usage. Whether it means absolute endlessness or not must be determined by the context. In Matthew 25:46, the words of the Lord Jesus Himself are, “These shall go away into everlasting (or eternal) punishment but the righteous into life everlasting (or eternal).” The same Greek word is used for “everlasting” or “eternal” in both the first and second half of the verse, and as our Lord was an honest teacher, and did not juggle with words, it must mean the same in the first part of the verse that it does in the last. No one has any question that in the last half of the verse the life is absolutely endless, therefore the punishment must be absolutely endless. But this is not all. Another expression is used to indicate the absolute endlessness of the punishment of the persistently wicked, namely, “forever and ever.” The exact translation of this expression is “Unto the ages of the ages,” or “Unto ages of ages,” which represents not merely years tumbling upon years, nor centuries tumbling upon centuries, but aeons tumbling upon aeons in endless procession. It is the strongest possible phrase for absolute endlessness. It is used twelve times in the last book of the bible. Eight times it is used to describe the duration of the existence, reign, and glory of God (which is, of course, absolutely endless); once it is used of the blessedness of the righteous (which is, of course, endless), and in the remaining instances it is used of the torment of the beast and false prophet and the persistently sicked. Furthermore, there is absolutely no warrant in the Scriptures for supposing that the wicked will ever be consumed in the sense of annihilated. The words “destruction” and “death” so frequently used of the wicked never mean annihilated.